Champagne for snails: Its all about the beans. Its all about the beans. Its been a while since February's last post - and before you know it- its March. Despite the absence of posting, my challenge has been more or less met- with something out of the backyard on a daily basis.The eggs came and went as a welcome contribution- and today I found out why- Spazz has gone back to her moult. The tomatoes are still struggling on- and hopefully the warm weather this week will help them along. I am pleased to say three of the guerrilla capsicums survived the picking raid and grew, so I am looking forward to a stir fry with the first one today! 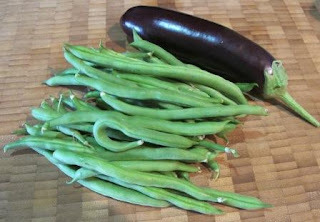 The first of the eggplants have also been picked and eaten along with the last of the jalapeno peppers. But whats really been keeping up the challenge are the beans! 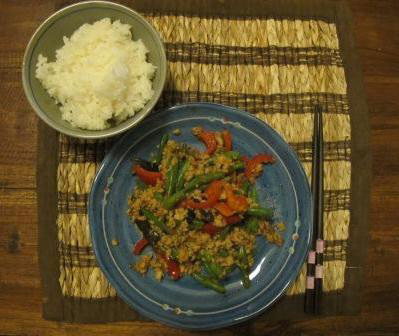 steamed beans- meat and three veg style, steamed beans in salads, stir fried beans and beans in Thai curry. One of my favourite seasonal recipes is this Chinese style Jill Duplex recipe for wok-fried green beans with chili pork. This recipe works just as well with free range chicken mince and it can also be slightly re-worked into a Chinese chili eggplant dish or a combo of beans and eggplant! The only trick with the egg-plant is to slice it into matchsticks and fry up in small batches first in oil (I use peanut). This allows the oil to soak into the eggplant -not exactly healthy but delicious. The egg plant is just set aside and mixed in later. I grow 'lebanese' eggplants as they lend themselves to Asian style cooking.